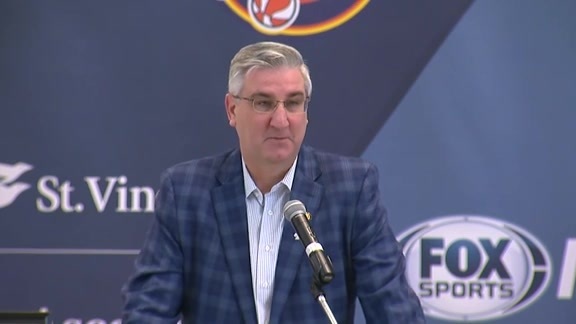 Jan. 18, 2019 - Governor Eric Holcomb officially proclaim Saturday, Jan. 19 Basketball Day in the state of Indiana in a press conference at Bankers Life Fieldhouse. 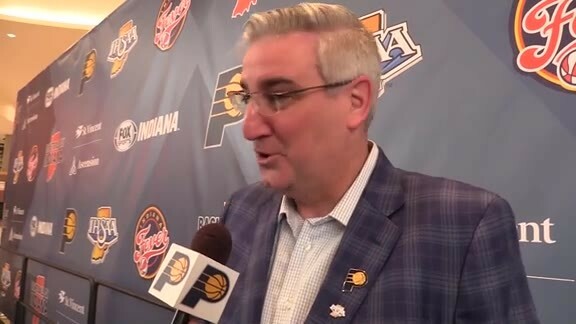 January 18, 2019 - Indiana Governor Eric Holcomb talked with Pacers.com's Eddie White about basketball in the Hoosier state and why he was excited to make an official proclamation to make January 19, 2019, Basketball Day in the state of Indiana. 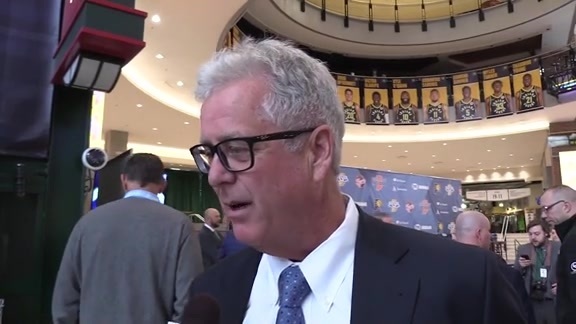 January 18, 2019 - At the proclamation of Basketball Day Indiana, FOX Sports Indiana General Manager Jack Donovan talked about the impact of the annual event and why it's so special to the state of Indiana. 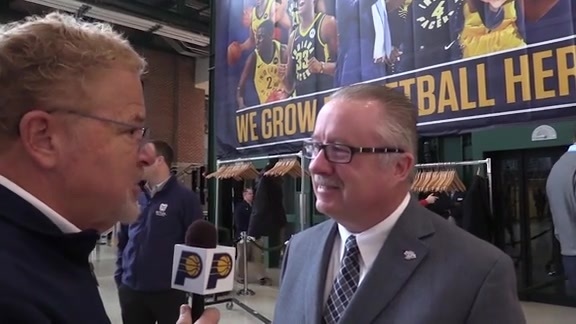 January 18, 2019 - IHSAA Commissioner Bobby Cox talked to Pacers.com's Eddie White about what Basketball Day Indiana means to him and how it impacts young athletes across the state. INDIANAPOLIS — Indiana Governor Eric Holcomb issued an official proclamation on Friday declaring that Saturday, Jan. 19 is Basketball Day in the state of Indiana. Holcomb made the proclamation in a special press conference at Bankers Life Fieldhouse, which featured a number of notable guests, including Pacers Sports & Entertainment President and COO Rick Fuson, Pacers President of Basketball Operations Kevin Pritchard, Fever COO Julie Graue, Fever legend and PS&E Director of Player Programs and Franchise Development Tamika Catchings, St. Vincent Chief Strategy Officer Christine Frederic, FOX Sports Indiana Sr. Vice President and GM Jack Donovan, IHSAA Commissioner Bobby Cox, Indiana University Vice President and Director of Athletics Fred Glass, Purdue legend Brian Cardinal, Butler University Vice President and Director of Athletics Barry Collier, Valparaiso Director of Athletics Mark LaBarbera, and FOX Sports Indiana broadcasters Chris Denari and Quinn Buckner. "(Basketball) is not just who are, but it's in many respects who we were throughout life and it's what we've gained from the game," Holcomb said. "Attention to playing by the rules and a strong worth ethic and what your role is and leadership...It is appropriate that (Indiana is) the epicenter of basketball in the nation." Saturday is the third-annual Basketball Day Indiana on FOX Sports Indiana, a celebration of Indiana's game featuring 14 hours of basketball. FOX Sports Indiana will broadcast a number of boys and girls high school games from both Bankers Life Fieldhouse and North Daviess High School, FOX will air both the Indiana-Purdue and Butler-St. John's games, and the night will culminate with the Pacers hosting the Dallas Mavericks for a Hickory Night game honoring Hall of Famer Slick Leonard.